One property related measures would more than fill the budget hole! But to be fair, if they're going to tax the gain on the family home, then interest payments, renovations, etc should be tax deductible. Sweet. I saved 37 billion. Just call me the Iron Prick. "The National Broadband Network is a commercial enterprise. It has no effect on the budget"
I presume like a superhighway in Europe, user pays. Driving from Northern Italy to Spain via Southern France at some obscene speed without stopping cost me 89euros (980km), I did it in 7.5 hours. Worst was 4 lane divided and normally 6 lanes. Limit Family Tax Benefit B - Yes, means test it further. Abolish support for car industry - Yes, they should make cars people want. It's called business. Abolish tax breaks for aviation fuel - Yes, No subsidies. Abolish tax breaks for seniors and older workers - Yes, phase it out as super becomes the dominant income source. Remove tax breaks for mining exploration - Yes, Again it's business. Why does it need subsidies? Apply capital gains tax to sale of family home - Yes, cheaper housing would benefit the economy with people having more disposable income. Reduce tax benefits for family trusts - Yes these are tax minimisation structures in the main. Another rort. Abolish withholding tax on foreign buyers of govt bonds - No. They're foreigners. Make em pay. Lift Medicare levy by 0.5% for DisabilityCare - Yes, make it permanent. It's part of being a civil society. Total savings: 41.6 billion. Sorted. A strong property market is a strong economy. Hehe. It's a long term plan of course. But the principles are sound. Sure, just to clarify, my status comment was about the future of the economy not your ideas. W00t! I'm up to two votes then! Philosophically I agree with all points except this one. Taxing the family home would lead to a drop in mobility of the workforce (and upgraders, sea/tree changers) and possibly the opposite outcome to what you expect in regards to house prices. A mobile workforce is a good thing. People would be reluctant to relocate for work. With each move they would be able to afford less and less housing. - More people would hold onto their old PPOR and turn it into a rental. Good for rental prices. - Upgraders (some who build) would be more likely to extend their existing home. Lessening supply of new housing and decreasing stock on market. - Sea/Tree changers would be more likely to stay put. In fact those retiring, who have been in the home for many decades may literally not be able to afford a move as they would likely be paying a lot of CGT. Yep, which is why stamp/transfer duty is such a bad thing. Also think of the extra traffic caused by people driving further because it is too expensive to relocate. Taxing the family home would lead to a drop in mobility of families. Let families suffer the consequences of their decision-making. IMO, it would temporary. If you take measures like removing negative gearing and taxing profit on sale of family home, then there is less money to offer on purchasing of residential property. The market will take its effect in property prices until they're affordable again. 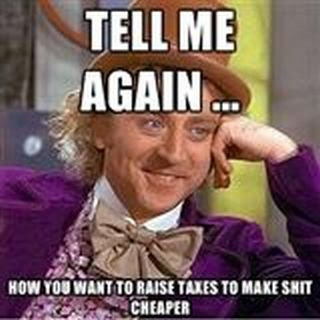 wait you want more taxes to make sh*t cheaper? I don't necessarily agree with taxing the family home since your interest payments were not tax deductible in the first place. But if the tax is introduced, then the money available to you to offer for another property is reduced. Since property prices are based on what the market can bear then (all else equal) it implies that they need to drop to make them affordable again. Yeah fair point zaph. The objective was making housing more affordable. I was thinking of CGT which was based on real gains but even so If taxing the family home had the unintended consequence you describe it would not be a good thing nor the desired outcome from my own POV. My favoured option would be a broad based land tax with a commensurate decrease in income tax to achieve the same outcome. Perhaps I should have written that. I'd also favour a broad based land tax, but with no change to income tax, but an abolition of stamp duty. This would increase mobility and liquidity in real estate. State govts rely heavily on stamp duty for revenue that fluctuates wildly, based on property turn over. Land tax would be a more stable source of tax revenue for the states. This policy would mean flipping would be easier and more profitable than it currently is. So i've been thinking about government spending and how many comments posts in the news are whinging about what the money is spent on. I heard the industry group claiming that they are not against the level of government spend but more what it is spent on. I think a lot here would agree with that. Likewise the hike to the medicare levy to fund the NDIS seems to have widespread acceptance apparently because we know where the money is going. So in that vein I was thinking about some way the public could indicate their preference for where their own taxes were spent. Something along the lines of a report would be received on your tax return of where your tax paid was proportionately spent. I don't believe that a system could work where everybody nominated their preference for spending and the tax paid would be only spent in those areas. Who would pay for the sky whales? What I was thinking was more along the lines of policies and costings OR a more general system that had broad policy areas listed and assigned a proportional weight to each as a guide to government as to the peoples will. It would be IT based. Would need security to ensure no double voting etc. ...because we know where the money is going. The thing that bothers me is that we don't know where it si going. We just know where they say it is going. I ahven't heard anyone say that the money is completely sequestered. But I think all taxes should be sequestered. "This tax is for this, if we don't spend it on that then after a year or 5 or whatever we discuss whether the money should be returned to the tax payer and the tax stopped." You'd need a "general use" fund to cover unexpected things and percentage buffer pool to cover projects which blew out a bit. But if you spent less on roads you can maybe transfer up to 5% of the expected cost to the general fund and from the general transfer to another project which is running over (but again with maybe a %5 of total projected cost limit). It is after all pretty much how everyone else budgets and is not really that hard. It has the bonus that taxes which are no longer used (i.e. the medicare levy to cover the cost of indonesia) don't just get kept because the government likes having that money. General use == consolidated revenue. I agree it shouldn't be that hard. I would like an itemised bill for my taxes. The data is already there and IMHO should be publicly available. Except where the data is sensitive. As an initial disclaimer I'll state that I don't really have an thorough understanding of government accounting procedures. However, from what I do know it seems that government departments will spend every penny they do get allocated. The reason for this is simple. They don't get any reward for saving. If they do save anything then next years allocation goes down because they didn't appear to require the budget from last year. At a micro level, I work across projects and BAU and use things called cost codes to allocate my work to a bucket of money. Other projects are very reluctant to allocate me project codes because they fear I might rort them by allocating time I haven't spent on their bucket. My manager who has his own bucket might encourage this as it would save him paying for me. Personally I don't care that much as long as I get paid. As far as I'm concerned I'm doing the job of keeping the departmental systems going. I take this seriously as literally hundreds of businesses depend on the systems and compensation claims for down time are huge. The point is that there is a whole industry above me that is responsible for keeping tabs the accountability of public expenditure. Actual IT guys doing the actual work in government are a minority. The tip of the iceberg. If joe public is wondering where the dollars are spent then here is your answer. There are the guys from accounting, integrity, the toe cutters, HR etcetera. I have always thought that privatisation couldn't be more efficient because they have an imperative of providing shareholder return PLUS do the work. If they could work without the overhead of all of the accountability that needs to be in place for spending public money they might indeed be more efficient. This means they would need to quote a fixed price. No one in their right mind does government work for a fixed price. Therefore they to require the same cost codes to do the work as I do and therefore the same bureaucracy. But do you believe it?! A re-elected Labor government would quarantine changes to the taxation of superannuation for five years, Treasurer Chris Bowen has announced. Labor said the proposal would promote "confidence and stability" in the $1.6 trillion retirement savings sector, which is expected to swell over the next decade as the compulsory super guarantee rises from 9.25 per cent of Australians' pay to 12 per cent. The announcement is a win for the super industry, which has been calling for super to be left untouched for up to 10 years - an idea previously dismissed as unrealistic by Australia's first superannuation minister, Nick Sherry. But Labor on Wednesday said it would make no changes to the taxation of super before the election, and it would legislate the five-year freeze if it won the election. Advertisement"Australians are living longer, they need to feel that the superannuation system is fair and reasonable and that the superannuation policy is removed from the political cycles for genuine confidence in the system to build," Mr Bowen said in a press release. But the five-year freeze proposal was immediately criticised by the Coalition, with superannuation spokesman Mathias Cormann saying Labor was "trying to play catch-up with [the] Coalition on our commitment to no unexpected detrimental changes to super." The industry recently criticised the Coalition for its plans to defer the increase in the super guarantee to 12 per cent by two years. Colour me cynical but does this see the bulk of the Boomers through to retirement? Hardly. The first baby boomers would just be turning 65 or thereabouts. I suggest that the current system will be more generous / flexible than any changes they make in 5 years time and the changes will be incremental locking out future gens whilst allowing Boomers to adjust and maximise the pro's and minimise the con's of the current system. That might just be the cynic in me. Personally I think that Super is a great idea that's going to be stolen. Don't forget that 3% of your income tax was supposed to go towards paying you a pension but it was stolen by bureaucrats who put it into consolidated revenue for ease of management then it was promptly never mentioned again.